Another guest post from Chad. There’s a new wrestling blog called, IWantWrestling.com. It’s the brainchild of former WWE writer and current ROH on HDNET Producer David Lagana. After writing my open letter to TNA, and seeing all the tweets with #IWantWrestling, I asked myself what is it that I really want out of today’s wrestling promotions. When it comes to televised wrestling, I’ve given up on TNA. I watch WWE Raw, but rarely do I watch Smackdown. And after watching Raw, I usually have more complaints than praise for the show. I’ve only seen a handful of ROH on HDNet. None of the shows are must see in my opinion. TNA, in my opinion, throws too much on the screen and hopes something is good instead of focusing on a handful of storylines and making them meaningful. WWE is so repetitive you can skip a couple weeks and not miss any major developments. If you do miss something, it’ll be recapped and repeated enough on commentary to make you think you saw it. As for ROH, as I said, I have only seen a handful of episodes to I don’t think it’s fair to make comments about the show. So, with that being said, what would wrestling promotions have to do to get my regular viewership? Standard pre-body disclaimer; I don’t write this thinking my ideas are better than what WWE/TNA/ROH are currently doing. This is simply a list of things I’d do differently. This is not a magical list that will turn any wrestling program into the best show ever. While I have 12 years of television experience, I don’t know the first thing about writing or producing a wrestling show and dealing with all the variables that go with it. TNA and WWE have monthly Pay Per Views. The purpose of the weekly shows should be to build interest in the PPV and entice viewers to pay to see guys wrestle. Therefore the first change I would make is I would not have the champions wrestle on the weekly show. Unless it’s a special event there’s no good reason for a champion to wrestle. Especially if you have a heel holding the belt. Unless the rules have been rewritten, the champion only has to defend the title once every 30 days. If the belt only has to be defended once a month, why would a heel want to defend the title more than he’s obligated to? If the champion refuses to wrestle on a weekly basis, hopefully the fans will get antsy wanting to see him wrestle, and if he plays his role right they’ll want to see him lose. The fans desire to see a champion wrestle will be so intense that they will shell out money to see him in the ring. When the champion wrestles on a weekly basis, and looks weak, why would fans want to spend $40 to see him fight? When CM Punk was revealed as the new leader of Nexus, I was thinking a match between him and John Cena would make for a good Wrestlemania match. My concern was could the WWE creative team keep the buildup interesting for three months. After this past week’s Raw, the answer is no. For some reason in order to build a feud, the guys involved must interact with each other every week. Why? Flashing back to last year’s Wrestlemania, by the time the show went on, I had next to no interest in most of the matches because the guys fighting had been wrestling each other or interfering in matches for the previous 4-8 weeks. If you give me something on a weekly basis for free, why should I pay for it? I think the creative teams and those in charge need to think outside the box and find news ways to build interest in matches. For instance, at Wrestlemania 26, Shawn Michaels and the Undertaker had a rematch from Wrestlemania 25. This time Shawn vowed if he couldn’t beat the Undertaker, Shawn would retire. 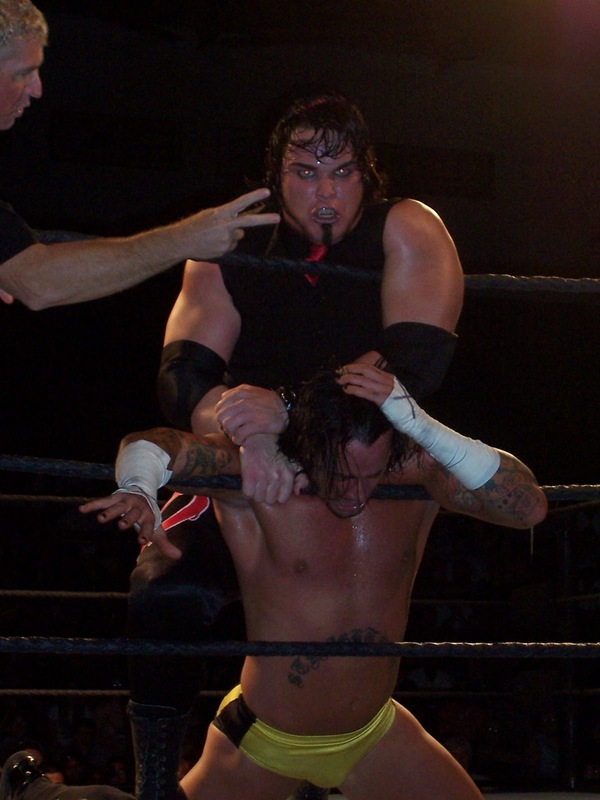 The buildup was mostly Shawn attacking Taker after matches or the two of them having a face off inside the ring. If I had written the storyline, they wouldn’t have been in the same ring after Taker accepted Shawn’s challenge. With Shawn’s career on the line, and Shawn having lost the year before, he should have been determined to not end up with his shoulders down for the three count. I would have taken a few pages from the Rocky IV script and had several weeks of training videos showing Shawn working out in the ring with a sparring partner learning how to escape Taker’s signature holds. Have Shawn talk about the need to end Undertaker’s undefeated Wrestlemania streak. How his loss the year before eats at him because the Heartbreak Kid is Mr. Wrestlemania. If you keep them apart from each other, building to match with vignettes and promos, when they finally step into the ring, the atmosphere will be more electric. Less talk, more action. Please! Does every show have to start with a 15 minute in ring promo? Most of the time the meat of the promo could be said in 5 minutes or less and is going to be recapped multiple times throughout the show so what’s the purpose of an extended promo? At least mix the format up a bit. Maybe start the show with a match to get the fans excited, and then in segment two give them the promo. It’s time for the GM to take a backseat. I remember back when I first started watching wrestling Jack Tunney was the President of the WWF. He was the one who would make big decisions when the time came. And when there was no decision needed, he wasn’t seen. Now the GM or whatever the person in charge is called is either on screen or mentioned in almost every segment. It’s overkill. Like having wrestler interact with each other every week kills interest in a potential money match, having a GM constantly adding or changing matches to a show makes the show look slapped together. Since the GM usually sets up the main event during the show, what would happen if the GM wasn’t there one week? Would there be no main event match. I’m slightly stealing this from one of Lance Storm’s blogs, but when a show goes on the air, all the matches should be set. Has there been any UFC or Boxing cards that get changed on the fly or matches added without warning? If the GM needs to make weekly decisions they should set up the following week’s show. That’s just a short list of items I’d like to see on a wrestling program. I don’t see any of them happening anytime soon though. I’m sure I’ll keep watching anyway. What do you think of these ideas? And what would you change if you had the power?